This recognition also showed the world that we truly care about fair trade, and that it’s at the core of everything we do at Earth Divas. But, what is the Fair Trade Federation, and what does it do? The Fair Trade Federation is a non-profit trade association who’s goal is to strengthen and promote North American organizations who are fully committed to doing business by fair trade practices. Build Capacity- Fair Trade is a means to develop producers’ independence. Members maintain long-term relationships based on solidarity, trust, and mutual respect, so that producers can improve their skills and their access to markets. Members help producers to build capacity through proactive communication, financial and technical assistance, market information, and dialogue. They seek to share lessons learned, to spread best practices, and to strengthen the connections between communities, including among producer groups. Respect Cultural Identity – Fair Trade celebrates the cultural diversity of communities, while seeking to create positive and equitable change. Members respect the development of products, practices, and organizational models based on indigenous traditions and techniques to sustain cultures and revitalize traditions. Members balance market needs with producers’ cultural heritage. Another important role of the The Fair Trade Federation is promotion. The FTF works tirelessly to spread awareness about fair trade, and how important it is for consumers to consider the rights and lives of the workers and artisans around the world that produce so many of the goods we take for granted. People who work in the fair trade industry see fair trade as common sense: something we must practice, as human beings. However, many people in the world have never heard of fair trade, or they might give little thought to where their goods come from and how they’re made. Highlighting the plight of foreign workers and artisans is probably the most important role of the FTF. Education is the only way to change things long-term. Once people become aware of the problem, and they make an emotional connection to people working two-thousand miles away, they realize they have to change their behavior. The FTF lights these little fires of awareness all of the world. And, one tiny flame leads to another, which leads to another…and that’s how real change happens. 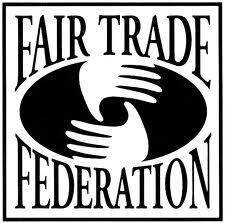 So, we give thanks to the Fair Trade Federation for the incredibly important work they’re doing around the world!